It is difficult to find our Malaysia thick black soy sauce here in the US and I will usually end up using the one imported from China. No doubt they are black but I don’t like the smell and flavor of it. I finally found our Malaysia black sauce in New York and I lug the heavy bottle all the way back to PA. After buying it in NY I found out they do sell it in PA. What a bummer!! Anyway, I love using black soy sauce in my cooking. I think food taste better when it has dark caramel color to it. The first dish I cook with the dark soy sauce was this Mee Goreng. What do you think? Do they look appetizing? 1. Mix all the seasoning ingredients together and set it aside. Heat up the wok over high heat. Add in about 3 tbsp olive oil. Sauté garlic and shallots until fragrant and lightly brown. Add in the chicken. Stir fry for until the chicken changes color. 2. Add in the shrimps. Stir fry until the shrimps turn pink. Add in the noodles and the seasoning mix. Continue to stir and toss until the noodles is cooked and well mixed. Lastly add in the bean sprout and chives. Give another few toss till well combined. 3. Check seasoning. Dish out and serve warm. The mee goreng looks mouthwatering! fried noodles topped with an egg is one of my favorite dishes. i would love to know what else you brought back home? i bet a lot of great little cooking gems? I love mie goreng and this one looks a bit like char kway teow with egg noodles, yum :). I heard all Malaysian sauces are very expensive over there. But when craving hits, I guess price doesn't matter anymore. Not sure how Malaysian black soy sauce taste but I been using Chinese dark soy sauce cooked in saucepan with black bean paste to get that certain taste I like. Chinese dark soy sauce taste sweet which do not want. Cooked till evaporate to use. Yes, it looks appetising! There are quite a no. of brands of thick soya sauce in M'sia but the one from Farlim, Ipoh, Orchid brand is not too bad. Gert, I thought there is an Asian grocer there in PA where u live? Anyway, it's great news that you manage to find the dark soy near home. ;) I remember I too had such "problem" while in CA , but mainly it's the brands that we are familiar with not in store. I guess we just have to go with the flow. Of course the noodles looked good... pass some over now! Noodles, Yum! It's amazing what a slight difference in an ingredient can do for a dish! I agree with you, it's really difficult to get the nice black soy sauce from others country. I still find Malaysia's one is the best. Your mee goreng looks perfect and look really appetizing! I'm sure that soy sauce had help you a lot. Happy cooking with dark soy sauce!! Whether it's mee or bee hoon, I can eat a lot. Yours is good and tempting! Yeap, not easy to find our local ingredients & sauce over in US. Glad that you finally found it. hehe... This looks more like hokkien mee! But slightly drier than that. I love both anyway! Btw, did you buy the dark soy sauce or dark caremal soy sauce? What brand is that?In NZ also not easy to find initially by lately not too bad.Sinner told me of an asian shop which is quite far from where I live and I managed to get 2 bottles..I think the brand is Yuen Chun Cap Datuk.Anyway,your noodles look just perfect...cukup hitam! !Going back next month and I'm going eat this until fed-up...."Uncle,Hokkein mee 1 plate..black-black a bit,ah"...lol! Of course looks yummy! I like mee goreng like this with dark soya colour. I have had difficulty to buy dark soya sauce too. I don't like kicap manis cos it's not dark enough. I usually ended up buying the one from Thailand which gives dark caramel colour. But, I have never come across Malaysian ones :( Can you pls show me how it looks like? Ltndsey, yea they just start selling this Malaysian dark soy sauce here in PA. I will post up the picture in my coming post. Reese, thank you. Yea you notice we hokkien lang like our dishes orr orr ha ha..
Vanillasugar, I didn't buy much from NY. I can get most of my ingredients in PA.
Pei-lin, only now they import our Malaysian black soy sauce. Yes I will be participating the Merdeka Open house. Cooking Gallery, yes a bit like char kway teow. I love using Malaysian dark soy sauce too! Adds such a nice colour to food! Carol, I will post the picture of it once I snap a picture of it. Bee Bee, yes there is one Asian grocery near my house but the thing they sell there mostly from China. But if I go down to Philly I can find a bit more of Malaysian and Indonesian stuffs. Kitchen Corner, I remember years ago Singapore ban dark soy sauce, right? Do they sell it now? Busygran me too. I like this kind of quick and easy meal. Kristy, it is dark caramel soy sauce. Shereen, that is the brand I bought. You know lah we Hokkien suka our dish all hitam hitam. No hitam not appetizing ha ha.. Yea when you go back home makan kuat kuat ya. Leemei, I will post of picture of it in my coming posting. wow! I like your Ooo..Ooo mee goreng!look good leh!! oh! yes when I was shopping at HK supermarket and Kam Cheong(topline) at Elmhurst I saw few brand of Msian caramel sauce..some in plastic and some in glass bottle..I see nowaday more Msian brand products come in to US market..wow!! PA sell $5 each? hmmm...that quite pricey compare wt NY but if you can get there without carry all the way,it's worth it! Thank you for another delicious dish Gertrude! I am craving for some now. I am glad the caramel sauce is easily available here in Melbourne. My husband was over the moon since he found the dark caramel sauce in Perth... he will add to almost everything he cooks.. even mee mamak!! Looks very delicious. My family would love this. I need to cook a huge plate. Well, I think I can't find that thick soya sauce here in Scotland, especially here in Aberdeen. I also like my Hokkien mee look dark, then only taste nice, hehehe..Luckily you found a dark soy sauce. Wow, that is true dedication, carrying sauce back :) The noodles look perfect! 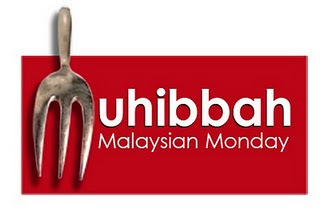 Thanks for joining us for Muhibbah Malaysian Monday. Lovely shot of your fried noodles! I can just imagine the nice aroma of freshly fried mee! Nice! I tried this recipe. It turned out excellent. first time my fried noodle became this delicious. Thanks. I added blended chili before adding the chicken because we like them spicy. Also an egg before the last few tosses, to make the noodles saucy. Thanks again.